If the unassuming, quintessentially English composer - despite Italian-Jewish genes! - Gerald Finzi had an obsession, it was with the poetry of Thomas Hardy. Hardy for him was, he once said, ��what the Bible must have been to Bunyan�, and he claimed to have felt a kinship with him from his earliest days. He never met the writer, but when Hardy died, there was a sale in Dorchester of his books and memorabilia. Finzi went down in hope, but most things were snapped up by dealers at prices the composer could not possibly match. However, he did come away with Hardy�s walking stick, something he treasured for the rest of his life. This wonderful CD the fifteenth volume in the Naxos English Song series is another important step in the process of establishing Finzi in his rightful place as one of the most important 20th century composers for the voice. There is here at least one great cycle (a term not to be used lightly) in Earth and Air and Rain, his op.15. This was first performed complete in 1943 at a National Gallery concert, sung by the baritone Robert Irwin, with Finzi�s friend the composer Howard Ferguson at the piano. To a Poet was not published as a song cycle during Finzi�s lifetime, but was assembled after his death from unpublished settings of various poets, a labour of love carried out by the composer�s widow and son, with the help of Howard Ferguson. It works as a cycle, and contains at least one magnificent song, the first of the group. By Footpath and by Stile, on the other hand, is the earliest of Finzi�s Hardy collections, and was completed in 1922. Unusually, the accompaniment is for string quartet rather than piano, maybe inspired by Vaughan Williams� On Wenlock Edge of a decade or so earlier. I enjoyed very much the young baritone Roderick Williams� previous Naxos CD, also of Finzi, which included two more splendid Hardy cycles, I said to Love, op.19b and Before and After Summer op.16. Williams has a fine, true voice, and sings with understanding but without mannerism, straightforwardly yet never missing a musical or verbal point of expression. His unaffected approach is matched and supported by the excellence of Iain Burnside at the keyboard. He is such a sensitive accompanist, yet makes a massive positive contribution, clearly relishing the beauty of many of Finzi�s piano parts. Earth and Air and Rain is a fascinating and, in many ways, devastating piece. It begins with a blithe evocation of early summer and its birdsong, Summer Schemes. Then we have the resolve of When I set out for Lyonesse, with its march-like tread and triumphant ending. Waiting both is Hardy�s dialogue with a star - interesting to compare this with Vaughan Williams� The infinite shining heavens in his Songs of Travel - and its mystery is captured perfectly in this performance, with a wonderful vocal colouring at the word �change� � �Till my change come�. � Touched never your lip with lip of mine. The single hanging note in the piano at the end says everything. 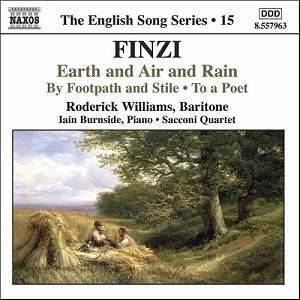 By Footpath and Stile, never recorded before, is early Finzi, composed when he was just twenty years old. Though immature in some respects, it still shows great assurance, as well as a powerful imaginative response to Hardy�s verse. The writing for the string quartet that supports the voice is always sympathetic, and sometimes quite daring, as in the spare lines of Where the picnic was, or the impressionistic opening of Voices from things growing in a churchyard. The best-known poem set in this group is The Oxen, which recounts the folk-legend that farm animals can be found kneeling on Christmas Eve. This is particularly interesting in that Vaughan Williams set this same poem in his Christmas cantata Hodie of 1953. Though VW had available the colours of a full orchestra, and uses his woodwind beautifully, the young Finzi rises to the challenge, capturing strongly the aching nostalgia of the final lines. Roderick Williams� voice is perfect for this music. It is a classic English baritone, with a firm lower register and a bright, clear top. Sometimes, I could wish he would �let rip� a little more � perhaps the climax of The Clock of the Years could be more shattering. Yet he uses this fine, supple instrument with striking musical intelligence. If I still narrowly prefer Stephen Varcoe in the more reflective of these songs, it is only because he has an almost unnaturally beautiful voice, which can do things that most baritones can only dream of; his Lizbie Browne is incomparable, for example. Varcoe�s Hyperion recordings made in 1984 are classics (CDA66161/2). Williams and Burnside however offer a splendid and completely acceptable alternative. More please!